Observers of the automotive industry can’t help but notice what the Hyundai brand has been doing for years. They’ve followed a familiar playbook. Modeling themselves after what Honda did when they first integrated into the U.S. market; Hyundai has followed a similar trajectory as Honda, although not quite as successful in sales (yet). The Korean brand started by making affordable cars for the masses, then slowly started winning over return buyers. 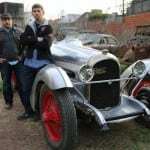 They did so by making aesthetically pleasing, yet affordable (American-made) cars. And in recent years, Hyundai upped its game further by offering near-luxury level interiors (something Honda has never done well). 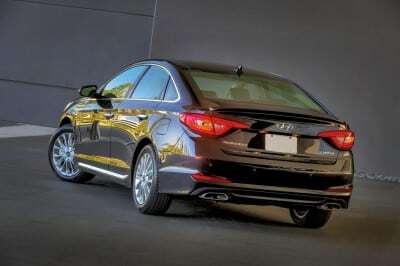 With that historical admiration in mind, I was pleased to test drive the 2015 Hyundai Sonata Sport this week. 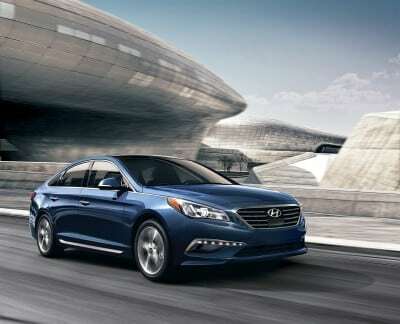 A Sonata, with its traditionally nice interior, with a sport-like power, that sounds fantastic! However, there were several aspects of the Sonata Sport that disappointed me. On looks, the 2015 Hyundai Sonata Sport seems to have regressed from the previous model year. 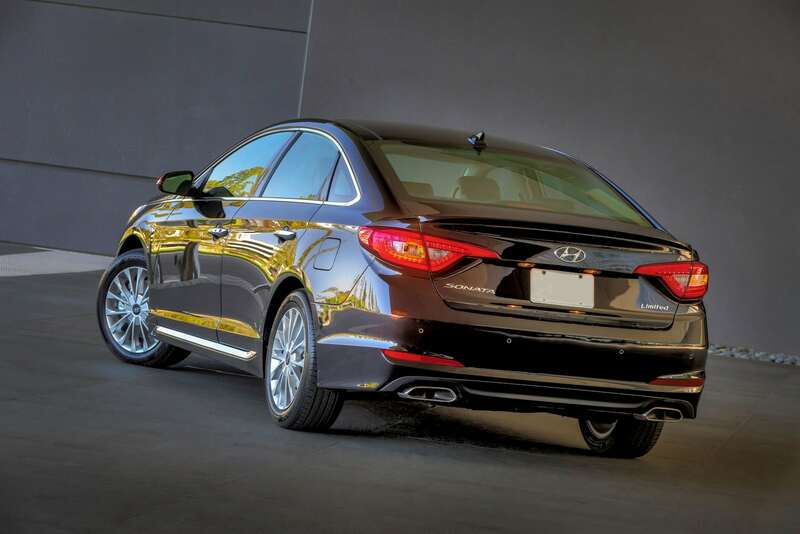 In fact, when compared to the regular Hyundai Sonata, the Sport seems to try a little too hard, to the point where it misses the mark. Smaller sporty touches like chrome accents and a rear spoiler seem out of place and don’t flow with the otherwise fine exterior of the Sonata. 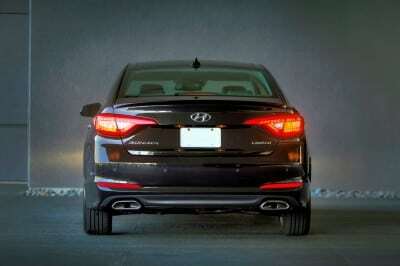 The Sonata Sport resembles many other mid-size family sedans on the road with little distinction. And I suppose that’s where some of my disappointment comes in. With a sport trim, I expect a little more refinement, a little more styling, not just the addition of a rear spoiler and a few additions of chrome. 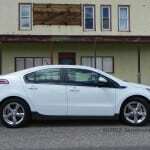 Additionally, the engine offered is lacking power for a sport-level trim. Now, there is a Sport 2.0T that comes with a turbocharged engine and more horsepower than the other trims. I’d like to try that option to compare and contrast to the otherwise tame 2.4-liter, four-cylinder engine found in the Sonata Sport. With new gasoline direct injection technology, this engine makes 185 horsepower, which felt somewhat underpowered for my preference. The drive mode option was the engine’s saving grace. With regular, ECO and sport options, you could maximize the engine performance for how you want to drive. In sport mode, the Sonata gave me just enough exhilaration to warrant the sport badging. 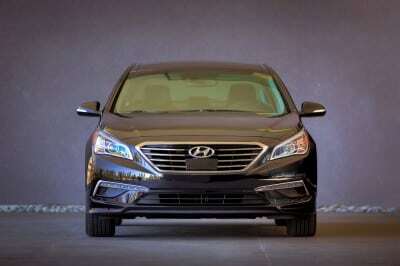 The front-wheel drive Sonata comes with a six-speed automatic transmission. The transmission handled itself fine and shifted smoothly. Road and engine noise were minimal and much appreciated. On the inside, the Sonata still proved how it differentiates itself from Honda and Toyota. Touch points were adequate, although seemed a little downgraded from previous model years. Interior space is improved upon with the 2015 model redesign, including the addition of almost two additional inches of rear legroom. 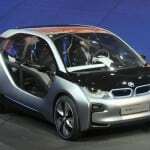 Passengers (both front and back) will be comfortable in the seats as well as headroom. Due to the sloping roofline toward the C-pillar, rear headroom can be a little impeded for taller passengers. A 16.3-cubic foot trunk is ample. Smart trunk technology is modern and cool. Any person with the key fob can open the trunk hands-free by standing near the trunk for more than three seconds. Five different trim offerings are available (six if you can’t the Sonata hybrid). From the base SE to the top-of-the-line Sport 2.0T. 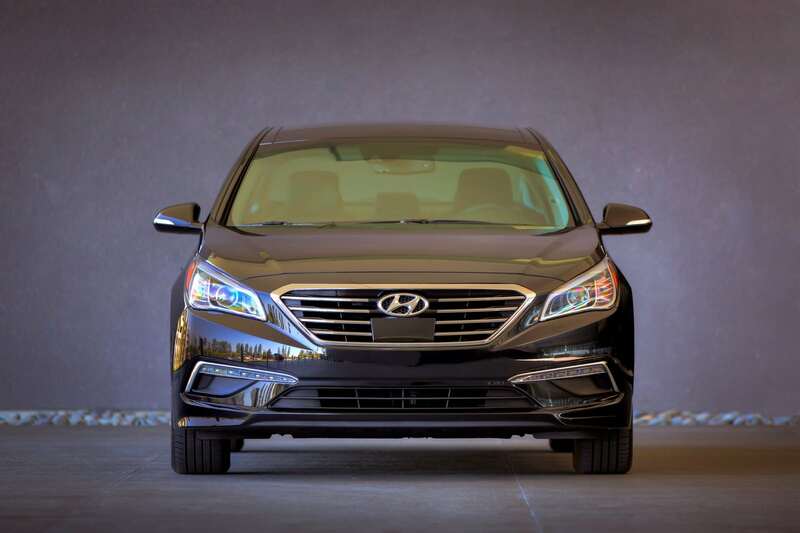 My tester was the Sport trim, which adds automatic headlights, lumbar-supported seats and five-inch touchscreen with Hyundai’s Blue Link telematics system. Pricing on the SE starts at just over $20,000 making the Sonata incredibly affordable for this ultra-competitive segment. 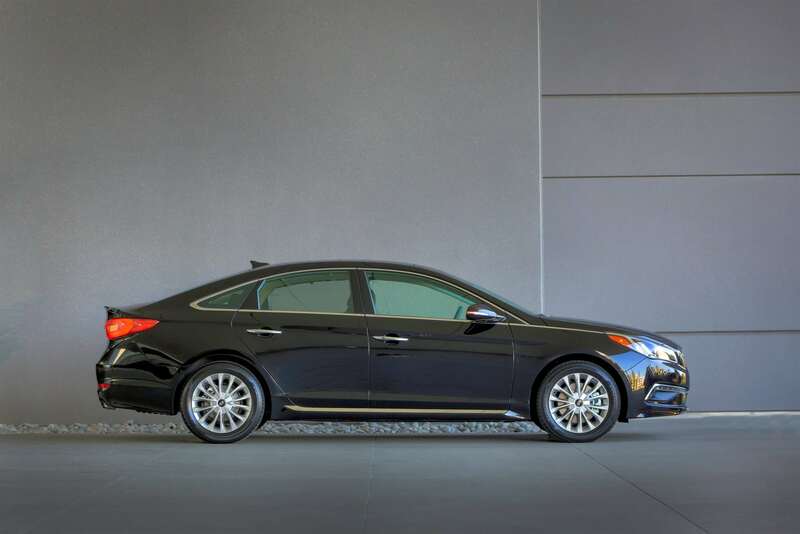 The Sonata sport has an MSRP of $23,175, which is still a good price considering the technology that comes with this model. In a week’s worth of driving, mostly in the sport-mode, I averaged nearly 29 mpg. The Sonata Sport has an EPA rating of 24 mpg/city and 35 mpg/hwy, which makes it quite competitive in the segment. Perhaps I was too harsh on this Sonata. 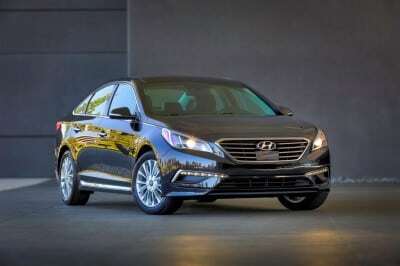 Although I treat every tester fair and equally, I had high expectations for this model year and the Sonata Sport didn’t quite live up to those lofty expectations. Perhaps false hope was given with the poorly named trim level of Sport when there were really very few sporty features with this trim.